To replace to a maximum the use of chemical products through reactions obtained by electrochemical means is the aim of the water purification technology from NVTerra. Even though electrochemical technics does not allow to solve a whole problem, its finality is achieved by the combination of technologies and processes: The developed process is clean, it reduces the manipulation and stocking of dangerous products and minimizes the formation of undesirable and clumsy wastage. This mastership is possible thanks to a perfect knowledge of the electrodes, the phenomena which takes place on them and their environment, just as a judicious choice of the materials constituting the electrolysors and the electrolysis technology. 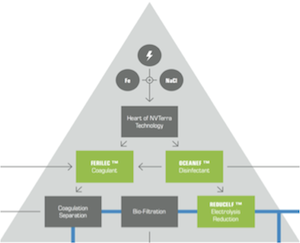 NVTerra is the technology owner of the water purification process by in-situ electrolysis. Only 3 consumables, easily available throughout the world makes the water purification process efficient and locally affordable!